Sringirikudi Lakshmi Narasimhaswamy Temple is located in Cuddalore Dist, 6 kms away from Pondicherry on Pondy – Cuddalore Bus Route, 3 kms west of Abhishekapakkam road junction. This temple is said to be over 1000 years old, built by famous King Rajavarman. In this ancient temple, which is a bit away from the Main road in a calm village, Lord Narasimha appears in a furious form with 16 hands as at the time of destroying Hiranya Kashyapu, facing west, about 6 feet in height. The Lord here is called Ugra Narasimha (Singha Perumal). This place is also referred as Abhishekapakkam. His concert is called Sri Kanakavalli Thayar and graces from a separate shrine facing east.. In each one of the sixteen hands of the Lord, either an action or a gesture is shown or a weapon is held in the following manner. To the Right - 1. Banner, 2. Sudarsana Disc set to motion, 3. Hand – Dagger, 4. Arrow, 5.Severing the demon’s head, 6.Knife, 7.Holding down Hiranyakasipu’s leg, 8. Tearing out Hiranyakasipu’s intestines. To the Left - 9. Holding up a garland of demon’s intestines, 10. Conch, 11. Shield, 12. Bow, 13. Mace, 14. Severed head, 15. Pressing down Hiranyakasipu’s head, 16. Tearing out Hiranyakasipu’s intestines. Yoga Narasimha and Bala Narasimha are facing north. (There are a total of 3 Narasimhas in this temple). 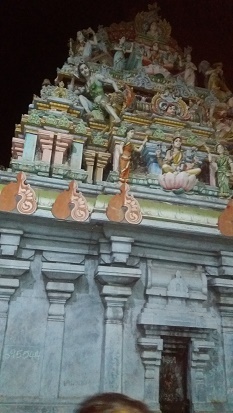 The Rajagopuram of the temple is with 5 tiers and has a tall flag post. Legend has it that Singirikudi is the place where Prahlada worshipped Lord Narasimha. As desired by his devotee Prahladha, Lord Narasimha graces in a huge form with 16 hands in the sanctum sanctorum along with Yoga Narasimha and Bala Narasimha in small forms. It is rare to see three Narasimhas gracing from a single shrine. A visit to this pilgrimage site is considered very auspicious as this divine place has an immense religious significance. If possible, a visit to the three Lakshmi Narasimhaswamy Temple, which come geographically in the same line - Parikkal, Parasina Kuppam and Singri kudi, on the same day is said to be very divine and auspicious. From 7 am to 12 noon and 4.30 to 9 p.m.
Those facing problems from adverse planetary effects, mentally distressed with debts and enemies, obstacles in marriages, etc pray to this temple and lights ghee lamps on Tuesdays and perform archanas with Tulasi leaves. Those whose wishes are fulfilled perform Thirumanjanam to the Lord and Mother offering clothes and feeding the devotees. By Air - The nearest airport is Pondicherry, 14 kms away. By Rail - The nearest railway station is Pondicherry, 11 kms away. By Bus - In the direct bus from Pondy to Cuddalore, get down at Thavalai Kuppam which is 3 kms away from the temple. Singri Kudi is 16 kms away from Cuddalore, 2 kms west of Thavalakuppam. Visiting the three Sri Lakshmi Narasimhar Temples (Parikkal, Poovarasankuppam and Singrikudi) in one day is said to be very good for a devotee. As advised by friends, we visited all the three temples in one day. P.S: Apart from Singrikudi Lakshmi Narasimhaswamy temple, there is also another temple called Singri Koil.